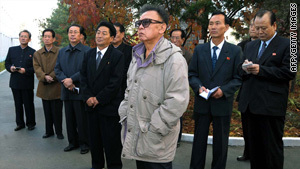 This undated photo released on October 25, 2009, shows Kim Jong Il, foreground, inspecting a university in Noth Korea. (CNN) -- China has invited reclusive North Korean leader Kim Jong Il to visit at his convenience, state media in both countries reported. The invitation was extended as an official from North Korea's Workers' Party visited China and attended a Wednesday meeting, in which the countries pledged to strengthen ties, according to China Daily. The two nations are celebrating 60 years of diplomatic relations. "The party and the government of China are ready to strive with the Korean comrades to put the relations of friendship between the two countries on a new stage, defend regional peace and stability, and achieve common development and prosperity by further expanding cooperation and visits in all fields," the Korean Central News Agency said. Following a visit by Chinese Premier Wen Jiabao earlier this month, North Korea indicated a willingness to participate in bilateral talks with the United States and return to so-called six-party talks over its nuclear program. China, Japan, Russia, the United States, and North and South Korea are involved in those negotiations. As North Korea's close neighbor, traditional ally and main provider of economic aid, China is widely thought to hold the key to solving the North's conundrum. North Korea remains economically depressed, politically unstable and diplomatically isolated. And in the past year, the nation has swung back and forth between engagement and animosity.